Over this special series on COP24, EURACTIV gives you a glimpse into the goings on of the UN climate conference in Katowice and what is driving the conversation there. In this edition: An update on the negotiations, climate denialism, South America, costs of global warming, and more. On the negotiation side. Six days after the COP24 started in Katowice, delegates from almost 200 countries continue negotiations on the rulebook to implement the goals of the Paris Agreement, with developing countries pressing to keep the ‘Paris momentum’. “We need to keep the momentum we had in Paris, we need to adopt the rulebook here,” said Gebru Jember Endalew, an Ethiopian who chairs the 47-strong Least Developed Countries Group at the UN Climate Change negotiations. “We represent almost one billion people, the people who are least responsible for climate change but among those most vulnerable to its effects,” he told reporters at an informal press briefing Thursday (6 December). “The longer poor countries have to wait for financial support, the larger the cost will become,” he warned. Countries – or Parties in UN jargon – are currently negotiating rules and procedures for implementing the Paris agreement, including provisions addressing transparency, accounting, compliance, use of market-based mechanisms, as well as periodic assessment of collective progress. These set of rules and procedures form the Paris rulebook. It is worth reminding that while countries can define their climate commitment individually, their action plans are subject to rules and procedures that are internationally agreed. This is what is at stake right now. For Gebru Jember Endalew, the question in Katowice is not so much the level of ambition of the rulebook to be adopted by 14 December, but the urgent necessity to adopt one. “I personally believes that the rulebook is not a bible, it is just a given document for countries to increase their ambition, to be better guided on how they report their climate plans and actions,” he said. Should the rulebook be adopted with a low level of ambition at the end of COP24, nothing speaks against a review of the text in 10 or 15 years, he suggested. “The rulebook is very important, this is what we are really fighting for,” he said, while expressing satisfaction towards the Polish presidency’s conduct of the negotiations so far. The diplomat also expects significant impulse from the Talanoa dialogue, that is the political phase of the negotiation which is to take place next week, in the negotiation process. US-Polish climate scepticism. Reference to the IPCC 1.5°C report is constant in Katowice: at press conferences, in plenary sessions, at side-events and informal meetings, in the corridors. This is because its scientific findings serve as an undisputed negotiating common ground. Well, almost undisputed. The very same day the IPCC celebrated its 30th anniversary, the Silesian Region of Polish trade union Solidarity issued a joint statement with US think-tank the Heartland Institute, known for its climate denial stance. The statement claims “there is no scientific consensus on the main causes and consequences of climate change,” going against the rigorous scientific conclusions established by the IPCC. “The Silesian Region of Solidarity, the Secretariat of Mining and Energy of Solidarity, and The Heartland Institute express scepticism of the assertions of the United Nations Intergovernmental Panel on Climate Change that the world stands at the edge of a climate catastrophe,” the statement goes on. The group said they met during COP24 and agreed to begin working together more closely “to advance sound, science-based public policy”. It also said that Solidarity translated the first edition of the Heartland-published Climate Change Reconsidered series in 2009 and that it was very satisfied by the new science and policy presentations from Heartland during their COP24 meeting. “The presentations assured Solidarity that their doubts about current, alarmist climate policy are correct,” the statement also reads. Saudi-Arabia. The evening before, environmental NGOs awarded the fossil of the day to both Saudi-Arabia and Brazil. It has to be pointed out here that NGOs are allowed to follow the negotiations in the numerous meeting rooms installed in the premises of COP24, which provide them with some insights of what is going on behind closed doors. For the NGOs, Saudi-Arabia is the most consistent, insistent and persistent voice undermining ambition in the negotiation so far this week. The country called for example for the deletion of the term “ambition mechanism” in the preamble to the Global Stocktake text on the grounds that it pre-judges the outcome of it, the NGOs explained. As for Brazil, the deforestation plans of the Amazon by newly-elected Jair Bolsonaro “are no laughing matter”: between August and November, deforestation rates went up 32%, the NGOs explained, also quoting a study according to which it might reach 25,000 km2 a year, with resulting emissions of 3 billion tons of carbon dioxide. South America. 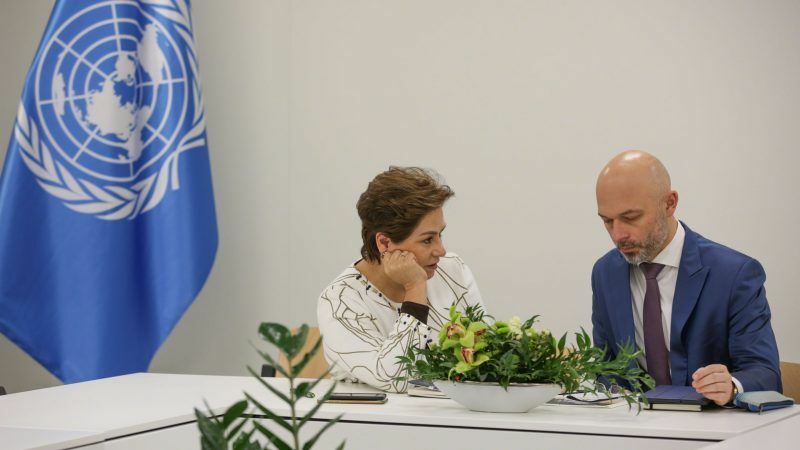 After Brazil retracted to host the next UN climate conference, Costa Rica, Chile, and Guatemala offered to host the conference and thus maintain the venue of the next summit in a Latin American country. No decision has been taken yet, it is expected by the end of this week. Every year, the conference headquarters rotates from one region to another. in order for countries and civil society to emphasise the climate agendas of their own region. With the candidacy of Costa Rica, Chile, and Guatemala, the process has begun to define which of the so-called GRULAC Group of 33 Latin America and Caribbean Countries will host the event. The climate change summit gathers an average of 25,000 people during the two weeks of negotiations. It is also a diplomatic process that lasts a full year, where the country assumes leadership to take forward the global climate agenda. Until now, Guatemala has received the support of Honduras. Christiana Figueres, a former UN official who was a key negotiator for the 2015 Paris Climate Agreement, is from Costa Rica. No doubt she will be pushing for her country to host the next UN climate conference. European Union. Meanwhile, pressure is mounting on the European Union to ramp up its emissions reduction pledge under the Paris goals. The EU could reduce its emissions by more than 50% by 2030 compared to 1990 by scaling up climate action in just three sectors: electricity supply, residential buildings and passenger road transport, Climate Action Tracker concluded in a new analysis. Together, these three sectors account for around 60% of the EU28’s emissions. The report, “Scaling Up Climate Action: European Union” sets out a pathway for the EU to decarbonise all three sectors by mid-century, which would make its emissions trajectory Paris Agreement-compatible, and create hundreds of thousands of additional jobs, improve health, and reduce expensive energy imports, the organisation said in a press release. New EU policies—including the binding target of 32% for the share of renewable energy in overall total energy demand—would lead to a 48% share of renewable energy in electricity generation by 2030: a good step in the right direction, but still not consistent with the Paris Agreement, it added. Global warming is costly. Global warming of 3 degrees C., which is the estimated trajectory based on countries’ current pledges since 2015, would lower global output by 2%, S&P Global Ratings said in its latest economic research note. Warming of 6 degrees C., which is slightly above upper estimates of the business-as-usual carbon emissions scenario, would push global output 8% lower, it finds, pointing out that the higher the temperature, the more damaging climate change will be—and in a nonlinear way. “More frequent extreme weather events that damage infrastructure will lead to faster capital depreciation. This will lower the rate of return on these investments and thus the incentives for capital accumulation. Increased temperatures are set to affect the labor supply through higher heat-related morbidity and mortality, as well as weigh on workers’ productivity, as hotter days tend to be associated with a reduction in working hours,” the report reads. It explains that uncertainty around the costs of climate change and the incentive of a global public good, have given rise to a “free-rider” problem, which has impeded international coordination between policymakers to cut carbon emissions. S&P recommends putting a price on carbon which would be the best solution to alleviate the effect, while underlining that current coordination problems mean that change initiated at intranational level and by markets are the next best options. It also pointed out that green investment may be considered a competitive differentiator in portfolios and help achieve sustainable business models. Considerable gap. As a year of never-before-seen extreme weather events is about to end, UN Environment released 6 December its fourth Adaptation Gap Report which shows a “considerable gap” between countries’ preparedness for climate change and the actual measures that should be put in place to prepare communities for a future of increasing climate risks, the UN body said in a press release. Unless adaptation efforts are strengthened considerably, heat and extreme event-related morbidity and mortality will continue to rise, it warned. “Climate change will have a significant impact on human health over the next few decades, and while progress has been made in reducing climate-change related diseases and injuries, current adaptation efforts are by no means sufficient to minimize future health impact of a changing climate,” it said. Emissions growth. Global carbon emissions are set to hit an all-time high in 2018, according to researchers at the University of East Anglia (UEA) and the Global Carbon Project. The projected rise of 2.7% in global greenhouse gas emissions is driven by a solid growth in coal use for the second year in a row, and sustained growth in oil and gas use, the report finds. That compares to 1.6% in 2017. CO2 emissions have now risen for a second year, after three years of little-to-no growth from 2014 to 2016, the report reads. This year’s rising emission figures are largely due to solid growth in coal use, but coal still remains below its historical high in 2013, the report continues, while pointing out that coal use may soon exceed this 2013 peak if current growth continues. Oil use is growing strongly in most regions, with a rise in emissions from cars and lorries, including in the US and Europe. Flights have also contributed to the oil rise and gas use has grown almost unabated in recent years. “The growing global demand for energy is outpacing decarbonisation for now. This needs to change, and change quickly to address climate change,” said Prof Corinne Le Quéré, Director of the Tyndall Centre for Climate Change Research and Professor of Climate Change Science and Policy at the UEA. “We need strong policy and economic support for rapid deployment of low carbon technologies to cut emissions across the energy and transport sectors, from buildings and from industry,” she added, stressing that while renewables are rising fast, it is not yet enough to reverse global emissions trends.